I don’t know much about growing seasons, but for some reason we get some winter squash in the dead of summer from our CSA. I’m not complaining – I love winter squash. It’s 105 degrees here in Texas today, but I decided to make one of my favorite comfort food recipes anyway. Maybe if I crank the AC down to 60 and pull the blinds I can pretend we’re having a snowstorm. The heat makes me a little crazy. Anyway, I made Cooking Light’s Roasted Butternut Squash and Bacon Pasta*. So good. But I have a few modifications. First, I use fresh rosemary with my squash roast instead of dried. Because I have it, and I love it. I think it brightens the flavor. Then, I use Gruyere cheese instead of provolone. Yes, it’s probably higher fat. But the nuttiness of the Gruyere with the squash is just delish. Provolone is a little blah. I also (predictably) use Pecorino Romano instead of Parmesan, because I always do. Once you go Pecorino you’ll never go back. I used CSA red onions instead of shallots because I had them on hand and they worked just fine. The last thing is kind of a question, too. I understand that when you make a white sauce, you start with the flour and oil, and then add the milk gradually. But what if there’s no oil? I always end up with a lumpy mess of glue. So I heat the milk on the stove and gradually whisk in the flour via a sifter. I know this sounds a little weird, but I haven’t found a better option yet. I’m open to ideas. 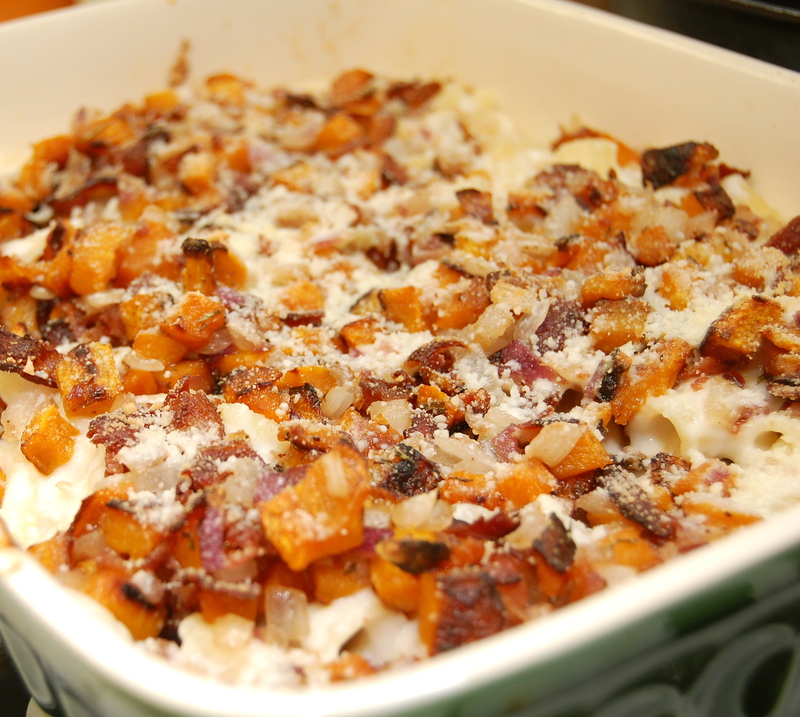 Anyway, this is a fun, easy recipe to use with your butternut or any sweet winter squash. Even when you forget to buy bacon and have to send your husband to the store for it. Ahem. *About the pasta. Does anyone else buy pasta in 16 oz portions and then use slightly more than half and end up with bags and bags of mismatched pasta that are slightly too small? Me too. I mixed two pastas – a rigatoni and a gemilli – that had equal cooking times.